Solving a Reader’s Real-Life Laundry Mess! I’m so excited to be able to share a real-life messy room and laundry solution ideas with you today! The lady who anonymously submitted her mess has already received a FREE copy of my brand-new eBook, plus she’s been entered into the drawing for a $50 Amazon gift card! Go here for details about how to submit your own mess. 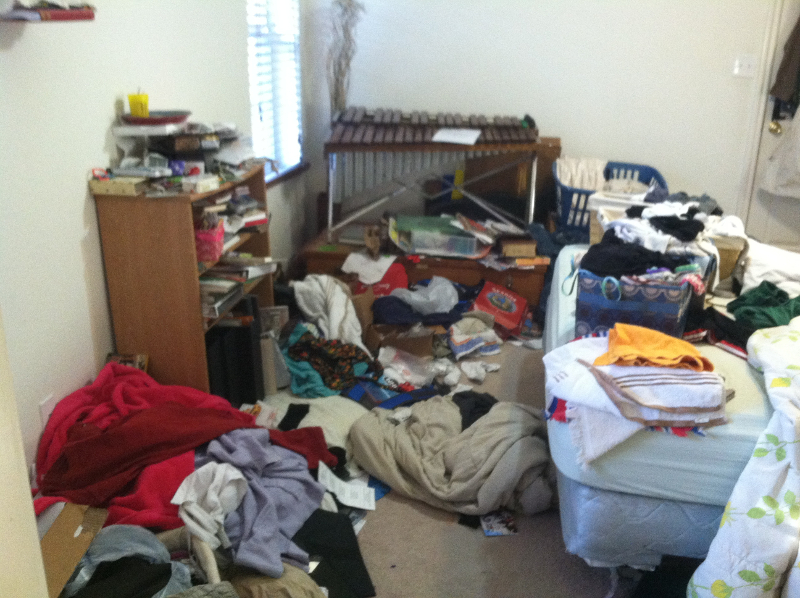 Problem 1: You’ll notice a lot of clothes on the floor. Part of this is because of something else you’ll notice…lack of hampers in the room. My husband didn’t want hampers in the room. 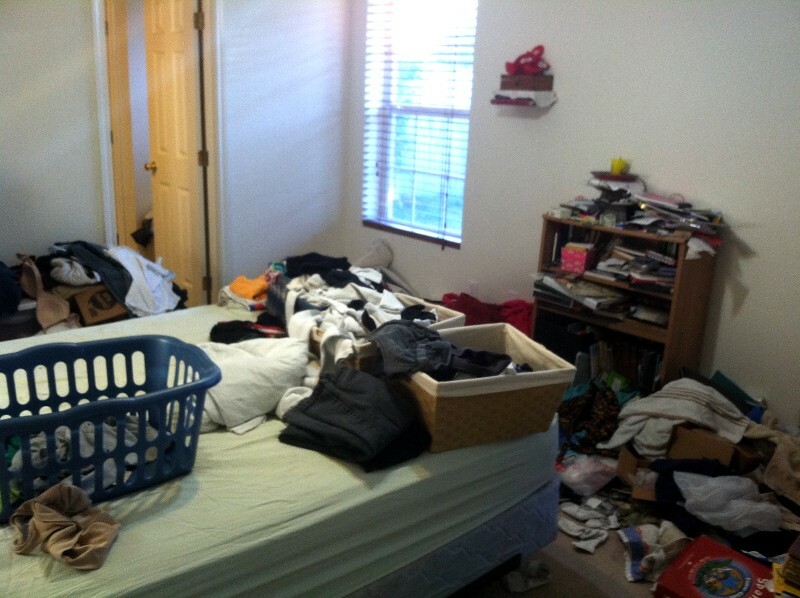 But, if there were hampers, I could put the clothes away where I actually change, which is usually in the bedroom. If you’re on a very limited budget, this one may be a decent option for you – it’s only $14.44 on Amazon right now. If you have a little more cash to spend, you may both really like this hamper, which doubles as a bench! Problem 2: I would love some sort of way to organize clothes that I am going to wear again other than just piling them on the boxes. Solution 2: I completely relate to this problem! I used to feel like I had to keep semi-clean laundry somewhere other than with clean clothes or dirty clothes. Here’s what I finally decided: if an item is clean enough to put on my body again before washing, then it’s clean enough to be put away with the other clean clothes! If it’s not clean enough to do that, then into the dirty pile it goes! Problem 3: Clothes will remain in boxes for now, because we’ll probably move soon. How long would it take to unpack clothes from boxes into dressers? A few hours, maybe? How long do you spend digging through boxes or baskets each day to find what you need? About 15 minutes?Let’s do a little math together: If you spend 15 minutes a day looking for clean outfits, then over the course of 12 days, that’s 3 hours. Or, you could invest 3 hours into unpacking your clothes and by the 13th day, you’ve actually gained more than all three of those hours back just by not having to search for clothes! You’re going to need dressers after you move. I’ve noticed that your room doesn’t have dressers in it, and I understand that your new home may have more closet space…. but it also might have less. Dressers and other furniture are all things you can take with you. I recommend checking on Craigslist for a sturdy dresser or two that you can use now without spending a fortune! As a bonus, having clothes organized will make moving easier because you’ll already have a good system in place. BONUS TIP: When you move, just take drawers out of dressers and put them directly on the truck with the clothes still inside – no boxes necessary! Problem 4: Organizing my kids clothes that they are constantly growing out of, the clothes they’ve grown out of (some of which I consign), and the clothes that are out of season is such a challenge. Where I live makes it harder, because while there is a clear summer (HOT, HOT, and MORE HOT), there’s no clear winter. It can be 80 sometimes in December, or it can be snowing then. I have so much more clothes out in winter than in summer and our shelf space can’t hold it. I’d love advice on how to best handle this problem. Solution 4: Kids’ clothes can feel very overwhelming! I’ve written two articles about kids’ clothing and laundry that you may find helpful. How to Tame Your Laundry Monster – laundry used to be a HUGE problem for me (sometimes it still is), and I wrote detailed steps about how to get that under control in this article. Clothing Organization – This article isn’t just about laundry. It’s about receiving hand-me-downs, how to store extra clothes, etc. It also discusses consolidating items and setting limits. As far as consignment items, I recommend going through the clothes that you may consign and sorting them into two piles – one for consignment and one for donation. Then donate your donation items ASAP. That should help get your consignment pile down to a more manageable level in a very short amount of time. My other suggestion to the kids’ clothing dilemma is to possibly keep your kids’ clothes in their rooms instead of yours. Setting limits, organizing clothes, and paring down the items will likely help the clothes to fit neatly in their rooms. I’m going offer a few more virtual-organization (non-laundry related) tips for this bedroom in tomorrow’s article, so check it out! In the meantime, what laundry-related solutions and suggestions do you have for this reader? My bedroom was revolutionised with the following idea for semi-dirty clothes: get a container for them! I have a plastic storage tub without a lid, but any large basket or hamper (sorry!) could do the job so long as it’s wide enough to retrieve items without burrowing through it. It sits next to my regular laundry basket so it’s easily accessible when I’m getting undressed. It keeps the items contained in one spot, and thus looking tidy, and sets a natural limit for how many items I can have out at any one time, so I don’t pull out every single sweater I own on successive evenings so I have a massive pile of laundry come laundry day. I almost never fill it to the brim, though, because I really only need one of any given item in current rotation: only one sweater, one pair of thick fluffy socks that only got worn for an hour, one pair of trousers (which is usually only overnight anyway), etc. If I need a second of something I already had out, it’s more often than not time to put the first in the regular laundry. This is a great suggestion – thanks so much for sharing your tip! I like the idea of a large basket…one for me, and maybe, once he gets back, one for my husband (since he does the same). Thanks! One note…what’s in the plastic boxes are clothes (out of season clothes mostly), but the cardboard boxes…they are things from our last move, still in boxes. I have gone in and looked at them and they are things I want to keep (wedding pictures, and other things like that). You’re so welcome! And that note is good for me to know for when I address the rest of your room 🙂 Good luck organizing! Please share your little successes along the way! When we store clothes (out of season, outgrown/waiting as hand-me-downs), they are put in storage totes with the clothing size labeled on 3 sides plus the top. In addition to that, I include what age/height my children were when they wore those clothes. It helps me when a younger sibling has grown 3 inches over the summer. I have a better idea if a 6x or 7 will fit. Since the bedroom space is limited, the storage totes are organized on shelving units in our garage in size order. This makes it really efficient for us to move clothes to the totes or from the totes. We have 6 children who share bedrooms, closets, and dressers. To help be more in control of their clothing, their hang up clothes are organized by the rainbow. I don’t have them separate pants or dresses at this point. It’s so much easier for them to put their clothes away because all blue things are grouped together. And they can quickly see if the red dress they want to wear is in their closet. And since the order of the rainbow is something covered on so many children’s shows and school (including preschool) it’s something even our 2 1/2 year old can follow. These are fabulous tips. It sounds like you’re super organized with your kids’ clothes – thanks so much for sharing! I LOVE the idea of including the height your children were when they wore clothes on your boxes! My littlest is growing so much faster than my older ones are. They were always one size ahead, and he is usually TWO sized, but it comes in fits and starts so it’s hard to guess what size he’ll be.